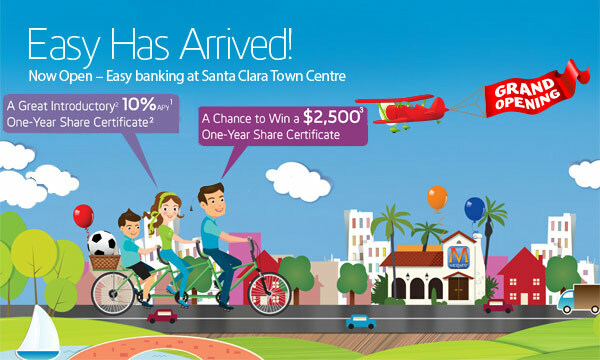 Easy banking has arrived in Santa Clara! Meriwest Credit Union has opened a new location in the Santa Clara Town Centre. Meriwest Credit Union is here to make banking easy again with great rates and the kind of service you just don’t find anymore. We’ve been serving the Bay Area for over 50 years - through convenient financial centers, online and mobile banking, and our locally staffed contact center. You can also bank on easy financial access everywhere with our national network of shared branches and over 30,000 surcharge-free4 ATMs. Learn more at meriwest.com/grand-opening or call 877-MERIWEST (637-4937) or join us for our Grand Opening event, Tuesday, July 28, 6:00-8:00 pm! 1. APY is Annual Percentage Yield. APY is calculated on the minimum average daily balance in the account each month. 2. Limited time offer valid through August 15, 2015. Annual Percentage Yield (APY) is valid for the stated term of the certificate. The minimum and maximum balance to open the account and earn the stated APY is $1,000. Limit one term share certificate per member. Penalty for early withdrawal. Rolls into a regular 12 month pick-a-term at the prevailing rate. Certain restrictions apply. Contact the Credit Union for complete details. Consumer accounts only. Funds must originate from non-Meriwest accounts only, and offer available only at the Santa Clara Financial Center. Membership is required with a one-time, non-refundable $5 fee. 3. NO PURCHASE NECESSARY TO ENTER OR WIN. Sweepstakes is restricted to persons at least 18 years of age. Entries must be submitted at the Santa Clara Financial Center by August 15, 2015. Entry forms available at the Santa Clara Financial Center located at Santa Clara Town Centre, 2042 El Camino Real, Santa Clara, CA 95050. Winner will be selected during the week of August 17, 2015. Winner need not be present to win. Complete rules will be available at the Santa Clara Financial Center, or you may receive a copy by mailing a self-addressed stamped envelope to "Santa Clara Grand Opening" Sweepstakes, PO Box 530953, San Jose, CA 95153-5353. 4. Other fees may apply. Deposits federally insured by NCUA. Membership is required with a one-time non-refundable $5 fee. We do business in accordance with the Federal Fair Housing Law and the Equal Credit Opportunity Act. copyright 2015 Meriwest Credit Union. All rights reserved.